The Wine Show – Season 3 based in Portugal! Google translate came in handy for this. Thank you to @di-elle on tumblr for the links to this announcement. The most renowned and recognized wine television program broadcast in more than 100 countries, a global audience estimated at more than 30 million people and an average value of over 7 million euros, aims to dedicate the 2020 season to Portugal, with recordings scheduled for the second half of this year 2019. The project is being worked by Revista de Vinhos in partnership with Infinity Creative Media. 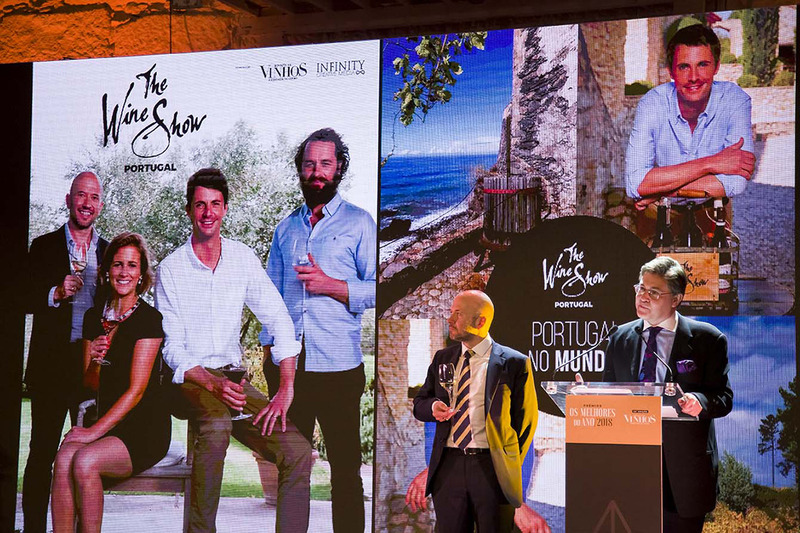 The great news was publicly announced on February 1, at Oporto Customs House, during the 22nd edition of the “Best of the Year” awards from the Revista de Vinhos. Joe Fattorini, a wine expert and one of the most popular and renowned journalists, radio and television presenters on wine, was on stage to detail the program and explain what they intend to make known to the world with the Portuguese season. “The Wine Show” will follow the successful editorial line defined for the series, starting from wine to Portuguese culture and gastronomy, promoting the country as one of the main producers of the world of wine and a tourist destination of excellence. There will be seven one-hour episodes presented by Joe Fattorini, Amelia Singer and Jancis Robinson and starring actors Mathew Goode and Mathew Rhys, who from a host city and emblematic location will travel through Portugal and will meet the main protagonists of the vine and wine, revealing stories and, from them, the Portuguese wines. The last episode will be a special “Wine and Gastronomy” to work on Portuguese products, with Portuguese chefs presenting the diversity of the country’s offer. The novelty of the season will be brought by the rest of the team, with Joe Fattorini, Amelia Singer and Jancis Robinson to travel around the world looking for wines that they will bring to Portugal, where they will be commented and proven. Around the program will be worked a set of videos and promotional materials for dissemination in social networks and the press, with a return estimated at more than half a million euros. “The realization of this project, whose viability depends on the guarantee of support by public and private entities linked to the wine and tourism sectors, guarantees a worldwide visibility and an impact with immediate and extremely positive results from the point of view of communication, promotion and image of Portuguese wines and their affirmation in global terms, “says the director of the Wine Magazine, Nuno Pires. ”‘The Wine Show’ is a unique opportunity for all partners. From the US to Australia, through China and Japan, Brazil and all of Latin America, the United Kingdom, Russia and all of Europe, as well as other places farther afield, our vast audience of wine connoisseurs and travel enthusiasts will surely fall in love with Portugal. With this season we intend to put Portugal at the top of the wish list of all travellers and wine lovers, “said Joe Fattorini. Other reports of this announcement mention that James Purefoy will also be in Season 3.